Cabin Creekwood’s Virginia Cabins are the best place for a vacation if you are looking for peace and relaxation while being convenient to fun surrounding towns. We understand how important it is to share your vacation with everyone in your family, including your furry friends. Nine of our Virginia cabins are pet friendly! 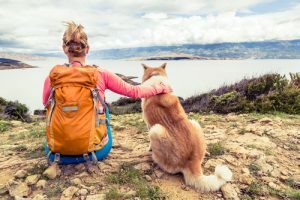 We find that most of our visitors traveling bring their dogs (as opposed to iguanas or parakeets), and lucky for you and your fuzzy canine, there are many things in the area that can make a dog happy. Cabin Creekwood is in the middle of nature, close to the Blue Ridge Parkway and the Appalachian Trail. Of course we can guide you to where the best spots are, but the local areas near the Parkway and Appalachian Trail have resources upon resources for hikers looking for an adventure. Pack up and take your pup for a mile or two romp in some of the country’s most beautiful mountain ranges. When you’re ready to come back, our cozy Virginia cabins will be awaiting your return. Animals are part of the family and Cabin Creekwood welcomes your entire family to stay with us. Adventures can only get sweeter when you share them with all your friends. Call us today to make a reservation for the relaxing vacation you’ve been wanting.